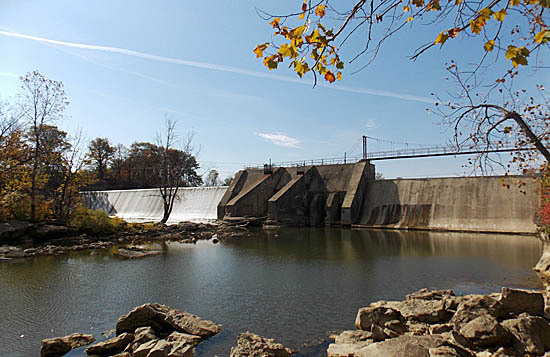 Fremont, OH – It appears the saga of the Ballville Dam removal has finally come to an end. For those not familiar with the Sandusky River and/or the Fremont, Ohio area, this dam has been the center of controversy and legal action for a good number of years. The two polarizing views are those who support the removal of the dam and those who wanted to save it. On November 3rd, 2015, the people were able to decide the dam’s fate. Fremont voters approved the removal of the Ballville Dam by an almost 1,000-vote margin. The results were 2,637 yes votes (61.3 percent) on the removal ordinance, and 1,663 no votes. Finally, it is settled… and I am thrilled with the outcome. I am a strong proponent of dam removal in general, but I was especially interested in this dam. This was due to a host of reasons most notably being; this is a river that runs through the city I grew up in, I have fished this river more than any other body of water, and my family owns waterfront property on the river. Needless to say, I love the river and wanted to see the fish that swim in it gain an extra 22 miles of unimpeded habitat. I can’t believe this will finally be a reality! At some point in 2016, I will be adding a page to the blog that will be devoted to the Ballville Dam and it’s removal. I hope to create a photo journal of the progress that will go from start to finish and beyond. I anticipate fish surveys and research will happen for many years to come, if not indefinitely.